Clixtell is a world leader in providing cutting edge solutions for call tracking and preventing click fraud. The company’s professional track record is based on expertise acquired by years of experience in developing state of the art software providing well established solutions suited for all business. The company provides custom made solutions for large agencies as well as to small businesses worldwide. Its bulletproof and flexible plans are designed to suite all clients according to their specific demands and needs and their field of expertise. 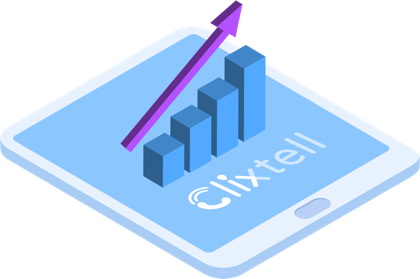 In a dynamic world that is all about performance, conversions and results, a world where you constantly need to be first and try harder than your competitors, it is Clixtell that can drive you to perform even better, improve results, to achieve more than ever before and prove it to each of your clients. Clixtells’ advanced tools for online advertising in the digital era have brought its global reputation as a constantly growing and improving company that strives to provide a safe & transparent advertising experience for all businesses and agencies. The company helps to optimize and protect PPC campaigns, track calls, increase sales & profit and improve customer retention. This is done also by offering clients attractive proposals that will assure them with full protection from click fraud along with the highest level of tracking and monitoring tools.